Products – Memory – Micro SDHC/SDXC UHS-I – Team Research Inc. Team Group micro SDXC/SDHC UHS-I memory card series supports for UHS-I Ultra High Speed bus interface. It’s a high-performance memory card satisfies the high-speed access requirement of smart phones, tablets, cameras, drones and vehicle video recorders. With read and write speed up to 80MB and 20MB (128GB)/ 80MB and 15MB (16GB~64GB), Team Group micro SDXC/SDHC UHS-I memory cards allow you to record and take Full HD videos and photos with no worries at all. Capacity from 16GB up to 128GB, Team Group UHS-I micro SDXC/SDHC memory cards provide large storage space and meet all the needs of a mobile life style. 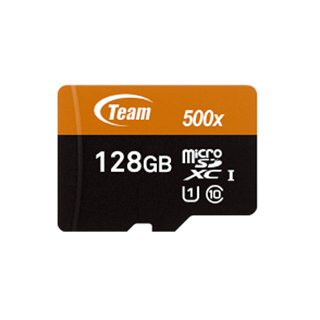 Store all the happy moments in Team Group’s high capacity memory cards. Team Group memory cards are shockproof, temperature-proof, waterproof, magnetic proof and X-ray-proof which offer your precious files an all- around protection. • Supports for UHS-I ultrahign-speed bus interface. • Enough to satisfy the high-speed access requirement of smart phones, tablets and vehicle recorders. • We reserve the right to modify product specifications without prior notice.